The latest RICS/Ci PHMS survey for February 2015 shows continuing positive sentiment for the real estate market in Portugal. The survey is consistent with positive economic news as Portugal grew its economy in 2014 and is set to improve on this growth in the year ahead. The survey is good news for any international buyers who have bought for the golden visa at the market low point 6 -12 months ago. It’s also a green light for those considering investing for the golden visa in the months ahead. Prices are increasing every month and the summer is the busiest time for international investors chasing property at the €500k+ price point, particularly in Lisbon. Portugal continues as the favourite destination among our residency visa investors as we enter 2015. The golden visa programme in Portugal attracts investors seeking residency visas due to its flexibility and relatively low cost. An investment of just €500,000 in real estate secures a residency visa but it is the additional benefits that put Portugal ahead of other countries that La Vida offer to our clients. A golden visa in Portugal allows freedom to travel throughout the EU Schengen visa zone and the ability to apply for permanent residency (5 years) and citizenship (6 years) without needing to live in Portugal. In fact investors need spend only two weeks every two years in Portugal to renew the visa. Compare this to other countries in Europe offering similar schemes such as Spain and Greece that require investors to live in the country for some years before citizenship can be applied for. Citizenship in Portugal and an EU passport means the holder can freely live and work anywhere within the European Union. For full details see the La Vida golden visas website. La Vida will be visiting China in December to promote the Portuguese golden visa along with several other investor visa programmes in Europe. Portugal is currently the number one destination in Europe for investors seeking a residency visa through investment. 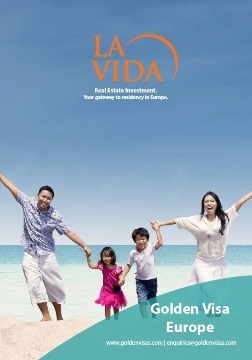 La Vida promotes several programmes including the real estate investment schemes in Spain, Greece, Malta, Cyprus and also the residency bond programmes in Hungary and Bulgaria. However Portugal is often the preferred choice for clients because of its low investment cost and the flexibility it provides for potential EU citizenship. We will be exhibiting at the Luxury Property Show in Shanghai from the 12th to 14th of December. 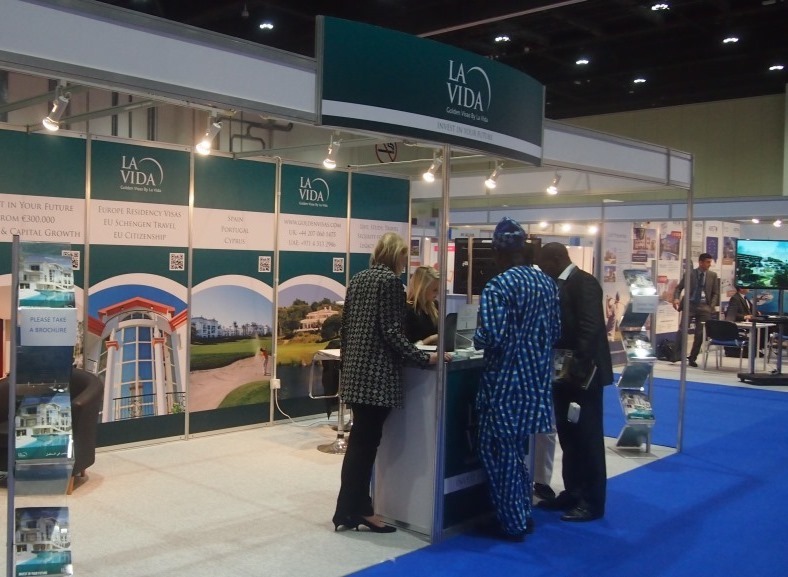 It follows on from our recent exhibition in Abu Dhabi at the International Real Estate Investment Show. The golden visa programme in Portugal has now attracted over €1 billion in investment from real estate buyers seeking the flexible investor visa that is on offer. A total of 1,649 investor visas have been issued so far in Portugal with numbers climbing quickly. To date in 2014 investor visa permits issued to foreign nationals are already double those issued in 2013. Most buyers are buying at otr around the €500,000 investment limit and choosing to rent the property. The visa programme does not require holders to spend time in the country. In fact just two weeks every two years to secure renewal. In return investors are free to come and go as they please into Europe without having to continually renew their Schengen visa for EU entry. The latest RICS Portuguese housing market survey shows positive news. Developers are seeing rising prices in Lisbon. This is perhaps helped by the influx of international buyers in the capital chasing property above €500,000 in order to obtain the golden visa. New buyer enquiries increased for the 11th consecutive month. It follows recent news from Deloitte in its Property Index Report that revealed Portugal to be one of the most affordable residential markets in Europe along with Germany and Denmark as the top three top destinations. Despite the positive news prices of property in Portugal remain well below their peak leading to a potential opportunity for today’s international investor seeking the residency visa. Investors considering the Portuguese Golden Visa scheme will be encouraged by the recent recovery in property prices following 6 years of decline. Prices of real estate fell more than 25% since the credit crisis in 2007 however figures from the last year show a turn in prices and sentiment in the market no doubt assisted by the level of international investment chasing the golden visa benefits. Real estate prices rose by 0.9% in Q2 of 2013, followed by a rise of 0.4% in Q3 and 1.4% in Q4. Prices for residential real estate in Lisbon are lower than most major European cities. Figures presented at Portugal’s 10th Property Conference held at the Jumeirah Carlton Tower Hotel in London last week showed Lisbon to be one of the most affordable cities for property investment. With an average price of €2600 per m2 Lisbon was lower than Barcelona (€4700 per m2) and Madrid (€5200 per m2). London toped the list with an average price of €21,800 per m2 more than 8 times that of Portugal’s capital city. There were 3500 foreign buyers of property in Portugal during the first quarter, many of them encouraged by the residency visas now on offer for purchases above €500,000. The Portuguese economy is recovering and there are clear signs of an upturn according to the Secretary of State for Toursim, Adolfo Mesquita Nunes speaking at a conference attended by La Vida Portugal this week. Unemployment is down 1.4 percentage points from Quarter 1 to Quarter 4, 2013. Construction is up in the four main sectors including construction. Ten year bond rates have fallen from a peak of 7.47% to 3.71% and are now just 0.2% higher than those of Germany. Portugal is set to exit from the EU bailout programme in the coming months. Adolfo Nunes talked about the success of the government’s policies for encouraging inward investment including the golden visa programme and the new tax regime for non-habitual residents. To date 781 golden visas have been issued by Portugal, 2 in 2012, 490 in 2013 and 289 already in the first few months of 2014. The investor visa programme appears to be running at a rate of 1000 visas per year and climbing.